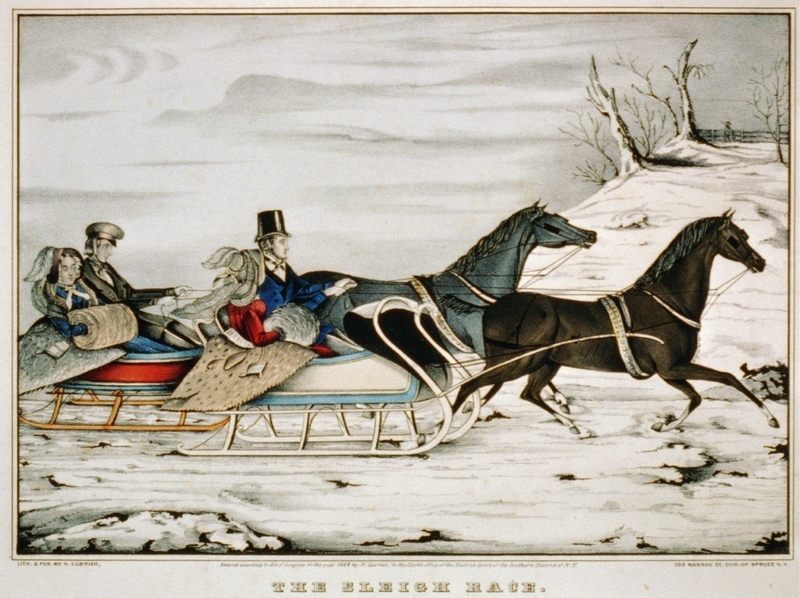 "The Sleigh Race," an 1848 lithograph from the popular firm of Currier & Ives, depicts two drivers testing their cutters in side-by-side racing. During the winter, drivers in Western New York are accustomed to seeing huge trucks plow snow off of roads and scattering rock salt to melt any ice that remains. For Sheffield Peabody and other drivers of his time, however, snow and ice sometimes were very welcome visitors. This is because dirt roads could become horribly rutted, and wooden “plank roads”—Sheffield and his friend George Coats traveled one such toll road to Rochester in September of 1851—were about as bumpy as you might imagine. A horse-drawn sleigh over untracked snow might have been the 19th century’s closest approximation to the pleasures of high-speed motoring. As a young man often called upon to pick up or deliver goods at all seasons, to run errands necessary for the family farm, Sheffield would have been as attentive to sleighing conditions as to the weather—and indeed we see him remarking upon “good,” “very good,” and “first-rate” sleighing, but also “rather poor,” “thawed and spoiled,” and “slumpy” conditions. On 17 March 1858, there is simply this sad journal entry: “Sleighing is gone. It is a-breaking up.” It isn’t difficult to pick up on his tone of disappointment at the season ending, nor to infer that this churchgoer cut loose a bit when sleighing. In this regard he was like many other young men of his day, whose sleigh races were portrayed by Currier & Ives illustrations and are the subject of James Lord Pierpont’s famous 1857 song “One Horse Open Sleigh” (aka “Jingle Bells”).